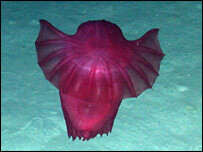 Exotic creatures that live at deep-sea vents will not be immune to the effects of climate change, a UK scientist says. It was thought that life at these fiercely hot volcanic fissures was so independent from the world above that the habitat would prove a safe haven. But new work finds that some of the animals are reliant on food sources from sea surface level, which could be affected by a change in climate. The findings are presented at the BA Festival of Science in York. At first glance, the deep-sea vents that scatter the globe's oceans would appear to be completely uninhabitable: life there would have to survive the enormous pressures of the sea bed, live in near pitch black and withstand searing temperatures of up to 400C. 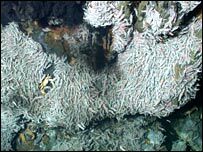 But - to the surprise of scientists who discovered the existence of these volcanic vents 30 years ago - a raft of weird and wonderful creatures, adapted to these extreme conditions, can do just this. Jon Copley, a marine biologist at the University of Southampton, who carried out the research, said: "These vents support lush islands of deep-sea life which is nourished by mineral-rich waters gushing out of the vents. "Thanks to this chemical energy source, these places seemed to be independent of the sunlit world above." But Dr Copley has discovered this is not the case. In the Gulf of Mexico, Dr Copley and his team used a remotely operated submersible to look at shrimps living around a related form of vent ecosystem known as a cold seep. It differs from a volcanic system in that the release of mineral-rich waters is at the same temperature as the surrounding ocean. He discovered that the creatures at this cold seep had a seasonal reproductive cycle. "The females spawn their eggs in autumn, brood them on the back legs during winter and they hatch out their young in early spring," explained Dr Copley. While seasonality in deep-sea creatures that live away from vents is connected to the availability of food sources, the vent's shrimps have access to a plentiful food source all year round. 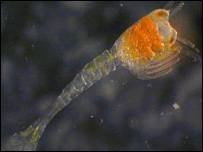 "We believe the answer lies in the shrimps' larvae," Dr Copley said. The team found that the larvae were leaving the vents and drifting to neighbouring vents where they completed their metamorphosis. "During that journey, they are feeding on material that is sinking down from the sunlit surface waters - and that food supply varies seasonally depending on where you are in the ocean," explained Dr Copley. The adults were timing their reproduction to coincide with the point when there would be the most food for their offspring during their travels, he added. Dr Copley said that this pattern has now been found in other shrimp species and mussels at volcanic vents. The biologist believes the finding could have wider implications. He said: "I used to think that what goes on in these vent environments was pretty much quarantined from what goes on in the sunlit world. "But this link suggests that changes to the life in sunlit waters can be communicated though to life in these remote corners of the ocean floor. "If climate change were to alter life in surface waters, our work suggests that potentially such changes could be communicated to the ocean floor." Other global catastrophes, such as an asteroid slamming into the Earth, would have a similar effect, he said.